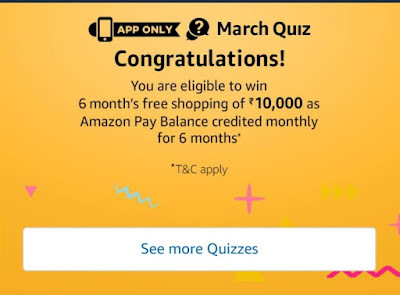 Amazon March Quiz Answers – Amazon India Users Have to Give Right Answers of This Amazon March Quiz’s All The Questions & Depend Upon Luck They Can Win Free Rs.10,000 Amazon Pay balance. Here are All Right Answers Of Today’s Amazon Quiz Of March To Win The Free Rs.10000 Amazon Pay Cash. A total of 1 participants will be selected as winners of this Quiz Contest who answer all 5 (Five) questions correctly. 1. Which of these is NOT a meaning of the word ‘March’? 2.In March the sun crosses the celestial equator and the day and night are of equal length. What is this phenomenon called? the ‘Ides of March’ refer to? 4. Which of these is a western zodiac sign associated with March? 5. International Women’s Day celebrated on 8 March is a national holiday in Angola, Armenia,Azerbaijan,Cambodia, Georgia, Eritrea, Kyrgyzstan,Laos, Moldova, Mongolia, Tajikistan, Uganda, Ukraine and Zambia. 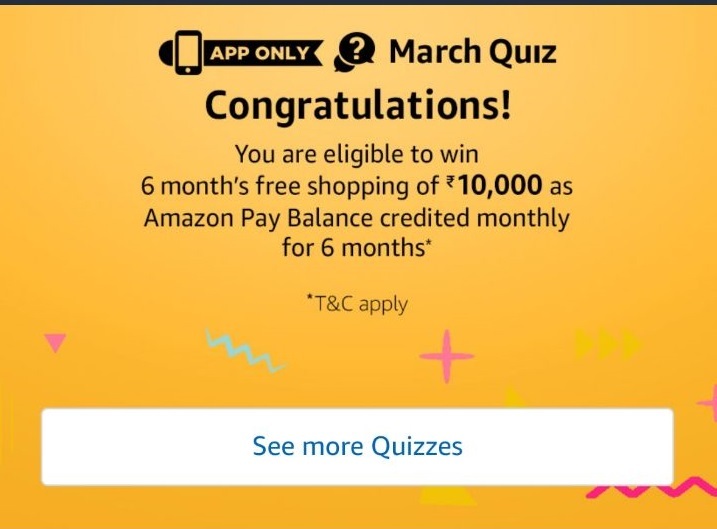 Suddenly , After Completing This March Quiz Of AmazonWith Correct Answers You Will See “congratulations Banner” That Means You Have Successfully Completed The Amazon Quiz Of March & Now Eligible to Win The Free Rs.10000 Amazon Pay Cash Balance. 1. 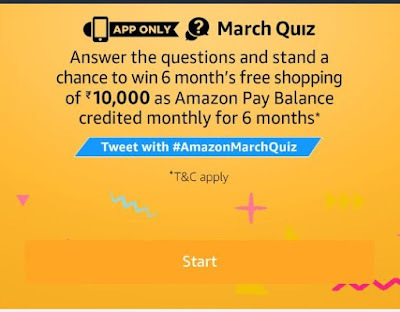 This Contest will commence on 1st March from 12:00:01 a.m. (IST) to 31st March11:59:00 p.m. (IST) (“Contest Period”).